One measure of a land-grant university’s success is the impact it has on people throughout its state. The Underwoods, from Baldwin County, Alabama, are leaders in the pecan industry and credit Auburn for significant contributions to their success. Gary Underwood grew up in a pecan orchard near Foley, helping his parents, Vaughn and Marcline, take care of the family pecan orchard, a task he continues today. Later he gained experience in the pecan nursery business while working with his uncle, Bill Underwood. Today, Gary and his wife, Billie Jo, are a farm family living in Summerdale and are extensively involved with the pecan industry. They have their own pecan orchard and a pecan and fruit nursery business. They assist with the family retail marketing of pecans. Billie Jo, a certified public accountant, helps with the business management. Sister-in-law Amanda Underwood runs the retail side of the business. Gary Underwood is a national leader in the industry. Gary is quick to recognize Auburn University as instrumental in his success. The proximity of his orchard and nursery to Auburn’s Gulf Coast Research and Extension Center at Fairhope has led to his being a frequent visitor to the center. A keen observer, he has kept up with the center’s ongoing research and has gained valuable information about the farming and nursery business. Underwood says now-retired station superintendent Ronnie McDaniel was a good source in the beginning, and former Auburn research associate Monte Nesbitt, a pecan and citrus authority, worked hand-in-hand with Gary on both the orchard and nursery projects. Nesbitt and Gary shared a love for budding and grafting, and they worked together on perfecting this intricate process. Current research associate Brian Wilkins brings a strong background in fruit research that is also valuable to Gary—he grows Satsuma oranges, blackberries, pears, plums, and persimmons, as well as pecans, in his nursery business. Auburn Extension horticulturist Bill Goff developed a technique for improving the success of whip-grafting nursery stock using small trees and placing the graft on controlled- temperature heating cables. Gary further refined the technique, which enables him to produce a marketable grafted container pecan tree in one season. 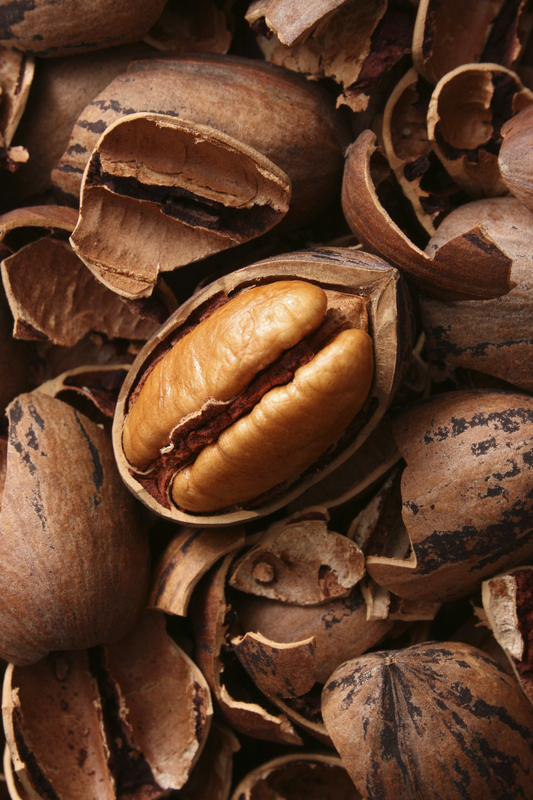 The process formerly took three seasons, so this was a huge advantage, especially considering the high demand for pecan nursery stock following the exponential increase in Chinese imports of pecans. Not only was the technique of how to propagate the nursery trees developed at Auburn, but most of the cultivars Gary grows were discovered and/or evaluated and recommended by Auburn. Since south Alabama is among the rainiest locations in the country where pecans are grown, resistance to disease is a major consideration in cultivar choices. Auburn’s nearby low- input cultivar trial at Fairhope served as a model for selecting the proper cultivars for Gary to grow. Gafford, McMillan, Syrup Mill, and Amling seedling selections were identified by Auburn scientists, evaluated thoroughly, and ultimately recommended, and these cultivars are the mainstays of Gary’s nursery sales. Once these were identified, members of the Auburn team, notably Cathy Browne, provided graftwood to Gary to allow him to propagate the selections and get them into the industry trade. Further, Auburn arranged—in cooperation with the Louisiana State Forest Nursery—to procure a source of seedling trees for Gary to use. As Gary developed his pecan orchard and nursery business, he also became involved in leadership roles in the pecan industry. He was selected Alabama Pecan Grower of the Year by the Alabama Pecan Growers Association in 1999, serving as president of the association from 1999-2001 and continuing in an active role on their board of directors today. His leadership expanded from state to regional to national offices, and he was elected president of the Southeastern Pecan Growers Association in 2010. Finally, in 2012, Gary became president of the National Pecan Growers Council. The latest national pecan association with which he is involved is the National Pecan Council, an organization representing the interests of the entire U.S. pecan industry—growers, shellers, and processors. The National Pecan Council named Gary as its Southeastern grower representative in 2012. This article was written by Karen Hunley of the Auburn University Food Systems Institute (AUFSI) to accompany Auburn Speaks: On Food Systems. To learn more about AUFSI, visit: www.aufsi.auburn.edu. To read more great articles like this one, visit: www.auburn.edu/auburnspeaks. By auburnresearch in Auburn Speaks, Food Systems, Gulf of Mexico Research and Restoration on November 17, 2014 .